-born academic and scientist. He is presently attached to the Institute for Microstructural Sciences. He is the contact person for the website: A WHO’S WHO OF SOME LTTE ACTIVISTS, OPPONENTS etc., PAST AND PRESENT. I refer to the website publication: A WHO’S WHO OF SOME LTTE ACTIVISTS, OPPONENTS etc., PAST AND PRESENT is found at: http://dh-web.org/place.names/posts/post-ltte.html. I refer also to the alphabetical list of names. In this publication you have published the name of Mr. Basil Fernando and that of the Asian Human Rights Commission by using very clear defamatory language, with the apparent deliberate intention to create the impression that Mr. Basil Fernando and the Asian Human Rights Commission are sympathizers of the LTTE which the government and several other governments around the world have named as a terrorist organization. These allegations are completely false, lack any basis in fact and are meant to damage the reputation of the concerned person and organization. Further the defamatory nature of the aforementioned references it also puts the concerned person and the organization in serious danger. Under the Sri Lankan anti terrorism law any person who is a sympathizer of the banned organization, the LTTE, may be subjected to arrest, interrogation and indefinite detention. Similar dangers also exist for the organization and all persons associated with it. Thus, the allegations in the publication on this website have the deliberate intent of causing such serious consequences in law. The allegation of being a sympathizer of the LTTE is also intended to cause hatred against the concerned person and the organization. In the present political and cultural context such allegations could expose the concerned person and the organization to acts of violence, including assassination. Besides such implications all the facts asserted in the publication are blatantly false. The Asian Human Rights Commission is not an organization affiliated with any religion, nor is it an organization that was inaugurated by Basil Fernando. 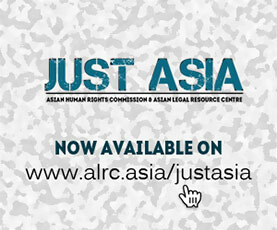 The Asian Human Rights Commission is a company that was registered in Hong Kong in 1986. The founders were: Justice Dorab Patel (Pakistan), Dr. Yap Thiam Hien (Indonesia), Judge Kenkichi Nakadaira (Japan), Prof. Upendra Baxi (India), Mr. Thongbai Thongpao (Thailand), Sen. Jose Diokono Philippines), Dr. Chandra Muzaffar (Malaysia) and Mr. Kan Sin Ok (Korea). The founders of the sister organization, the Asian Legal Resource Centre, were: Justice of India, P.N. Bagwathi, (India), Sen. Jose Diokono Philippines), Mr. Clarence Dias (India), Ms. Jane Kelsey (New Zealand), Mr. Mulya Lubis (Indonesia), Mr. Thongbai Thongpao (Thailand), and Mr. Kan Sin Ok (Korea). The sister organization has ECOSOC status with the United Nations. are alleged to have connections with these individuals” is also completely false and a pure fabrication deliberately written to create the impression of a linkage to the LTTE. The following sentence: “Basil Fernando is also alleged to have links with Paskaralingam” is again completely false and is a pure fabrication. This deliberate falsehood is written for the sole purpose of attempting to create a false impression of a linkage which has no basis in fact. The allegation of the character assassination of a bhikku is again a complete fabrication and a misrepresentation deliberately intended to create religious hatred. Further the statement that Basil Fernando “worked for NGOs in Vietnam and Cambodia. Here he was a link to the South-Vietnamese Catholics who were the main supporters of the US backed regime which collapsed. With the winding down of the post-war Viet and Cambodian operations of Western and UN agencies, Basil Fdo got set up in a private NGO in Hong-Kong in 1994, named “Asian Human Rights Commission” (AHRC). Its funding sources are kept veiled1″ is completely false as Basil Fernando never worked for any NGOs in Cambodia or Vietnam. Further he never worked in Vietnam. Mr. Fernando was, in fact, employed as a Senior United Nations Human Rights officer attached to the United Nations Transitional Authority of Cambodia and also as the chief of the Legal Assistance Unit to Cambodia of the UN Centre for Human Rights. Prior to that he was employed as a legal counsel for Vietnamese refugees in Hong Kong in a project run by the United Nations High Commissioner for Refugees. All these falsehoods have been concocted with the deliberate intent of creating false impressions with malicious motivation. The statement that the Asian Human Rights Commission funding is ‘veiled’ is also completely false as under Hong Kong law the organization is obliged to reveal its funding sources by the submission of audited accounts on an annual basis. Such reports have been submitted to the Hong Kong government regularly from the inception of the organization and have been subjected to query from any source. Hong Kong has an internationally renowned corruption control agency, the ICAC which oversees the transparency of all organizations functioning within the territory. The statement that the Asian Human Rights Commission relied on information from TamilNet is also completely false, as will be evident by a perusal of the large body of publications that the organization has made, all of which are available in the public domain. The name of Dr. Chandre Dhama-wardana is mentioned in the above website. That is the only name listed for the person who is responsible for this website. Your name therefore appears as the contact person for this publication. Therefore you are responsible for this publication, including all the defamatory statements mentioned above. We therefore demand that you inform us whether you stand by these statements set out above or whether you disassociate yourself from these statements. We hereby demand that you categorically condemn these statements as false and defamatory and tender a public apology forthwith. We also demand that you take all requisite steps to delete all the statements set out above and make a public apology. In the event that you fail to do so forthwith, we reserve the right to take legal action against you for the publication of the defamatory statements, as well as statements that could create public hatred and other serious harm to the Asian Human Rights Commission, as well as to Mr. Basil Fernando who was the Executive Director of the organization from 1994 to June 2010 and who is now the Director in charge of Policy and Programmes. We will also inform the hosting company, GoDaddy.com, Inc. (R91-LROR) about this letter being sent to you and our intention to take legal action against you, the website, A WHO’S WHO OF SOME LTTE ACTIVISTS, OPPONENTS etc., PAST AND PRESENT and the hosting organisation. Mr. Basil Fernando has already written to you at the above address provided in your website in regard to all the matters mentioned in this letter, but he has not yet received any reply from you. The AHRC requests all readers, and particularly the human rights organisations to write to Dr. Dharma-Wardana and protest the false and defamatory material referred to in the letter which could endanger the life of many persons. His contact details may be found from the above letter.